Travel on the Atlanta Streetcar system to see the sights and have a blast in this unique city scavenger hunt. Using the downtown streetcar system for transportation, and our cutting-edge app as a tour guide, teams see some of Atlanta’s biggest attractions and landmarks in a fun downtown city scavenger hunt. Each station in the game area has several opportunities for earning points. Teams set their own pace, and decide which stations they think will give them the maximum benefit. They will solve puzzles, take pictures of themselves doing outrageous things, decipher codes, find secret locations, and face off against other teams in mini challenges as they explore downtown. Welcome & Warm-Ups (5-10 minutes) Our staff welcome the participants to Downtown Atlanta and get everyone ready for a great event. We then lead some fun warm-up activities that also randomly create small teams. Event intro (5 minutes) Our fun and energetic staff give the group a quick tutorial on the app and any other event components to ensure a smooth start before they go off on their city scavenger hunt.. 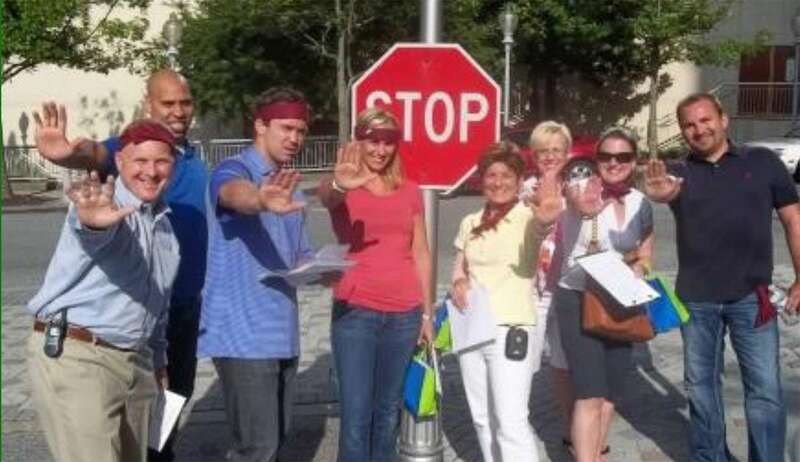 Friendly Faces: If teams spot a facilitator along the route or on the streetcar, they can tackle a bonus chal- lenge that is sure to be worthy of a few laughs and a picture or two. Station Challenges: These challenges are themed to match the history and flavor of the location they are found in. Brain Games: Teams work on this collection of various mental challenges for extra points as they travel. Partici- pants apply critical & creative thinking, and plan how to fit the extra projects into existing schedules. Shutter Bug: These are fun pictures that teams take of themselves at popular locations along the route and on the train. Creativity, quick thinking and teamwork are well rewarded as our game master awards points for each picture based on quality. Travel Trivia: Teams answer trivia questions about the area around each streetcar stop. They’ll need an atten- tion to detail to spot as many as possible. Landmarks: Teams receive a page full of pictures that are close-ups of various landmarks in the hunt zone. They’ll need to pay close attention in order to receive points for the landmarks they find and correctly identify. Scoring (5 minutes) Teams reconvene at the starting area and the final scores for the corporate scavenger hunt are dramatically revealed. Wrap-Up (15 minutes) At the end of the program, the teams all come together to share their experiences and the lessons they have learned. We end with a fun closing activity and a great group picture. Experience a unique adventure as a team. Explore the sites of downtown Atlanta.